Night markets, classy boutiques, fascinating little shops packed with antiques and handicrafts, and glitzy mega-malls with every brand name you can imagine! Thailand has it all when it comes to shopping, no matter what you are looking for. And no matter the destinations you visit you will find exciting shopping, whether in the big cities, in the resort towns and on the islands, off the beaten path and in the local communities. Bustling outdoor markets that give you an insight into the Thai way of life. Cool precincts where you can envisage an entire new lifestyle for yourself. Enormous shopping and lifestyle centres where there are playgrounds for the kids and leisure action such as bowling, skating and the cinema. In the markets you can try your skill at bargaining. In the curio stores you can buy intriguing gifts to take home. In the malls you can find everything. Shopping is one of the great Thailand experiences!! 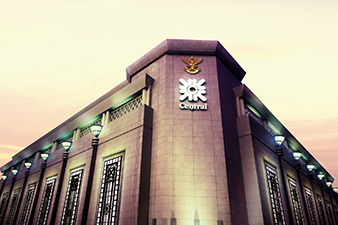 Browse outstanding shopping destinations or find out more on the Go Shopping Thailand website. Style is the keynote at this newest of Bangkok's shopping and lifestyle destinations, with world-famous brands and innovative local brands alongside exciting gourmet restaurant concepts in an environment whose architecture and interior design sets a new benchmark for Thailand. Central Embassy is the place for shoppers who understand style and creativity, who have firm ideas on how to indulge their individual tastes, and who revel in the refined pleasures of life. Location: at the intersection of Sukhumvit and Wireless roads, served by two BTS Skytrain stations, Chidlom and Ploenchit. 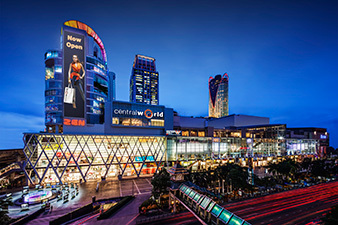 This exciting lifestyle destination is the largest shopping venue in Southeast Asia, home to the Zen and Isetan department stores and with over 500 shops and boutiques together with 100 restaurants and bars. 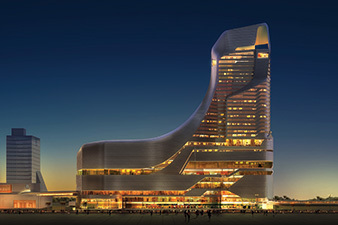 There are 15 cinema screens, a Kids' Zone and Learning Centre, the biggest supermarket in Thailand, and the outdoor square for large-scale events. 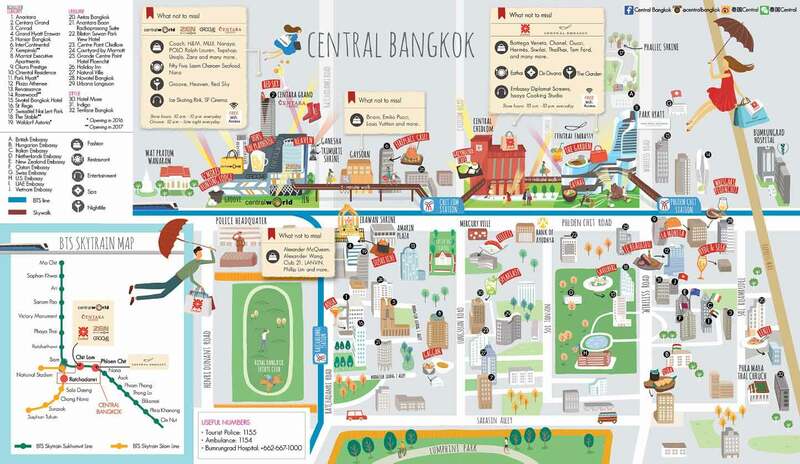 CentralWorld is the perfect setting for product launches, art exhibitions, fashion shows, and entertainment for all. Location: a short walk from Chidlom and Siam BTS Skytrain stations. One of Bangkok's most established shopping addresses, featuring world-class fashion brands, famous Thai designers, leading cosmetic and beauty products, children's wear, luxury home décor and exotic Thai handicrafts. Central Chidlom also caters for shoppers with a variety of sumptuous international cuisines at FoodLoft, an open-kitchen dining venue located on the top floor as well as a large supermarket with the finest selection of foods and fresh food products for everyone. Location: at the doorstep of Chidlom BTS Skytrain station. 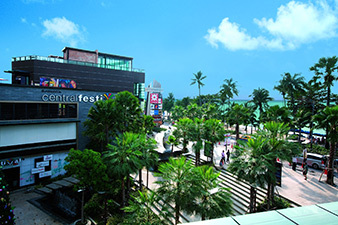 Featuring a stunning architectural design and with a holiday ambiance that draws upon the resort destination in which it is located, each Central Festival is a complete shopping and lifestyle venue with hundreds of shops including international and Thai brand names, along with retail outlets that are unique to the location. Central Festivals are regarded as being the most complete lifestyle complex in their location, and can be found at key destinations such as Pattaya, Phuket and Samui. 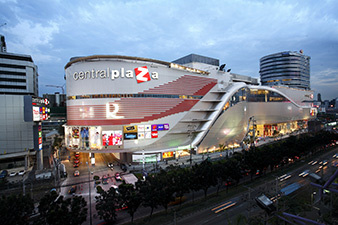 Occupying prime city locations, including two of Bangkok's business districts at Rama IX and Ladprao, and at Chiang Mai Airport, and Udon Thani, each CentralPlaza has a landmark design and is a one-stop destination shopping complex that along with the best names in international brand name shopping offers top Thai brands and locally produced goods such as quality handicrafts. Leading restaurant names and fast-food outlets are also featured, along with entertainment for all ages. 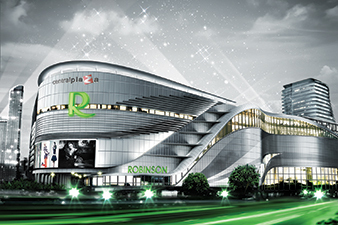 With over 30 department stores found at convenient locations throughout Thailand's major cities and resort destinations, Robinson Department Stores offer a varied range of products including clothing and fashion, cosmetics, accessories, home ware and sportswear, while selected outlets present a section with grocery and local and imported produce. Locations: Bangkok, Phuket, Chiang Rai, Suratthani, Ayutthaya, Udon Thani, Phitsanulok and many more destinations. Browse our shopping directory below to find outstanding shopping experiences at the destinations where our hotels and resorts are waiting to welcome you.